I love Tobago! We’ve been visiting the Island, on and off, for 17 years so I know it fairly well. My recent two week trip was a chance for me to fish (mostly at first light before we went out for the day) and for Lilian to relax, so here’s my first account of the fishing (more to come soon). For the first week we stayed at the Coco Reef hotel which is just a fifteen minute walk from either Sandy Point (Crown Point) beach and from Pigeon Point flats. So I didn’t bother to hire a car until the end of the week. For the second week we moved to the Magdalena Grand hotel which is on the Atlantic and has fishing from the shore and in fresh-water ponds within minutes of the rooms. The car was useful to get about from here. I always take two, four piece spinning rods (4 Surespin and slightly heavier Sure Popper) and two Shimano Stradic reels loaded with 30lb Whiplash braid. This time I’d chosen one front drag and one rear drag reel, consequently the spools were not compatible, so when I discovered that the rear drag spool was failing to lock on (the first time it’s EVER happened to me in many years) I was restricted to using just the front drag reel on the 9’9’’ rod. Anyway, the tackle was essentially my ‘bass’ gear. I complete the set up with a yard of 20lb clear Amnesia and a short wire, anti-barracuda trace of 20lb, knottable, American Fishing Wire with a 40lb swivel at one end and a clip of similar B.S. at the other. On my first morning I got out of bed too late (first light was about 05:15) and walked to the beach to find the sea pretty rough and weedy. Encouragingly there were plenty of baitfish and the pelicans were having a beano. Neither I nor three local fishermen had a sniff. The following morning I was better prepared with my alarm set for 04:45. I saw a couple of blitzes as jacks attacked bait close in but, typically, they had come and gone before I could gallop to the scene of the action. However, my Yo-Zuri Slider was attacked three times in succession on one retrieve but the culprit, a small jack, failed to make a solid contact. Later that day I went to the flats at Pigeon point to try for a bonefish. I was encouraged as I waded in to disturb a decent specimen grovelling in the sandy gutter by the edge. As an experiment I’d clipped on a size 5 silver, Ondex spinner which I thought would fish slowly above the turtle grass and coral rubble in the shallow water. Meanwhile, Lilian sat on the beach in the sun. I had only been spinning ten minutes when I had a strong pull and hooked a fish which broke the surface as it took. The fish fought well but was clearly not a bonefish and it was only after a couple of minutes that I managed to bring it close enough to see that it was a three-and-a-half foot reef shark, nicely hooked in the scissors. I began to wade ashore shouting to my wife to grab the camera. The fish was rushing about and taking line in short bursts but with a wire trace I wasn’t worried. The shark was tiring now and I was only a couple of yards from the beach when it decided to reverse and roll, twisting its way backwards up the line until the tail touched the braid and it was gone. ‘Buns!’ I said. I attached another trace and lure but my only other bite of the session failed to stick. The following morning the swell was huge and the sea was coloured but it was flat calm. As usual I was down on the beach before first light with the tide at half flood and rising quickly. Tarpon, some of them large ones, were rolling well out and I saw two jack blitzes beyond casting range. I clipped on a big, soft plastic Slandra in hopes of a snook from the coloured water. The bite, when it came, wasn’t quite what I expected and turned out to be a good sized lizard fish well progged on the huge hook. Later on I walked to Pigeon Point but the only excitement was when I was almost squashed by a dead coconut palm tree which fell across the beach, without warning, only just in front of me. Slightly shaken by the experience I packed in and returned for lunch. It was calmer the next morning and I clipped on a 10cm Coixedda 100 plug for my one-hour dawn session. Fishing from the longest jetty at Sandy Point and dodging the diving pelicans on every cast I hit a fish which rocketed away in typical jack fashion, ripping off line against a tight clutch. After a heart stopping struggle (there are lots of line-threatening rocks and sea fans) I was able to slide a 12 pound crevalle jack onto the strip of sand still exposed, unhook it, take a picture and release it. 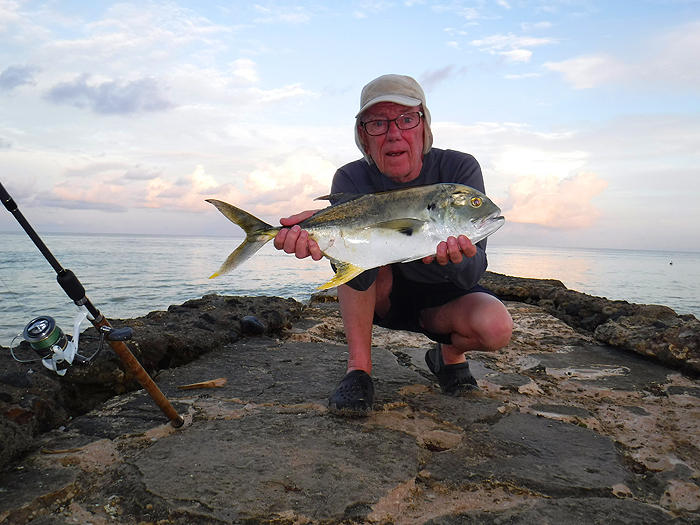 A nice fish at last – good start! Locals who came down later caught nothing. The following morning I tried again but lost the plug when a larger jack cut me off on the coral. 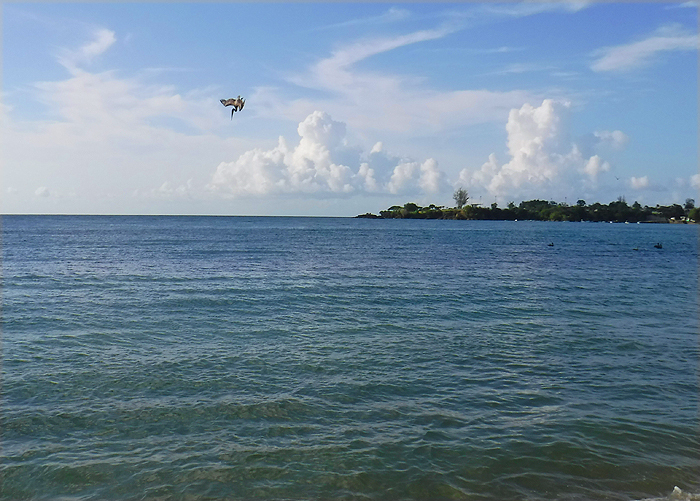 That afternoon day we visited Grange beach and (typically) saw nothing but hound fish and went on to Turtle beach where there were masses of birds and bait fish but no sign of predators. Having lost the smaller plug; for my next early session I switched to a black and silver Maria Chase SW. Having lost a fish I’d completely replaced the fairly old braid with new 30lb Whiplash and retied the traces. Even with my larger lure the jacks were still too far out. At about 05:40 I had a really solid take at distance. 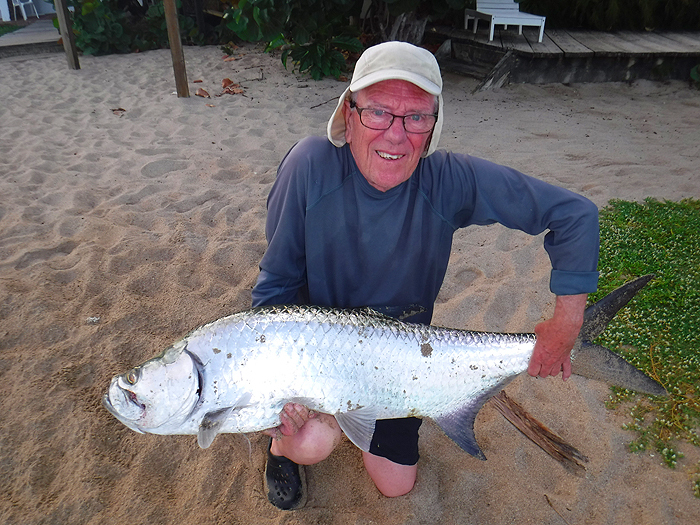 The culprit immediately launched itself into the air with gaping gills and flashing flanks – a good tarpon. Then it ran, jumped and ran again. 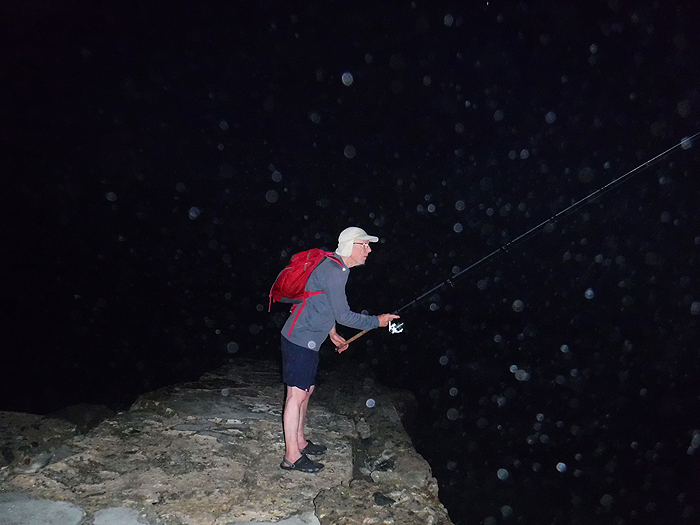 Several times it repeated the procedure and with each jump I had visions of the lure coming free – but it didn’t. The worst moment was when a low flying pelican clipped the line as it glided over. Fortunately it didn't tangle up. After twenty minutes of give and take I’d worked the tarpon close enough to be seen as it swam near the surface. How was I going to get it out? It still had enough energy for a couple of jumps but mostly it just kept making short runs. There were a few feet of sloping sand below the beach-front wall and after a further ten minutes of being towed along I managed to slide the fish ashore on a big wave. I jumped down and (carefully – I’ve been impaled on trebles before) grabbed the lower jaw and eased the tarpon further up the wet sand. I tried to lift it clear of the waves. I couldn’t – it was just too heavy. One of the local fishermen who had been watching jumped down beside me and together we managed to heave the fish up onto the dry wall. Phew! The tarpon was in mint condition, deep in the body and very thick across its back. I measured it at 63 inches to the fork of the tail, which is well over sixty pounds on the graph. Quite a fish on my bass gear and landed completely on my own. I was shattered. The chap who helped me to lift it asked if he could have it to eat and later told me that it had been barbecued that evening and fed an army of people. Excellent fishing. A view from Coco Reef hotel. 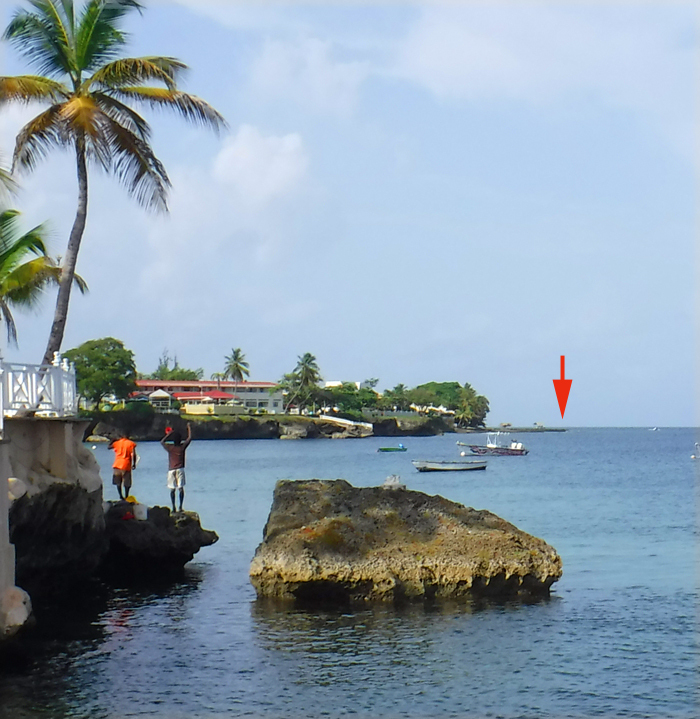 The arrow shows the jetty where I landed the tarpon. 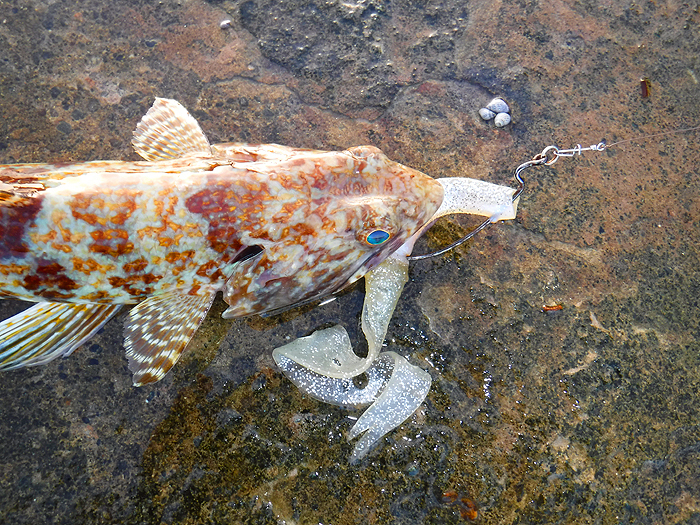 The spinners bane - a well hooked lizard fish. Crack of dawn. Best to be fishing before it starts to get light. 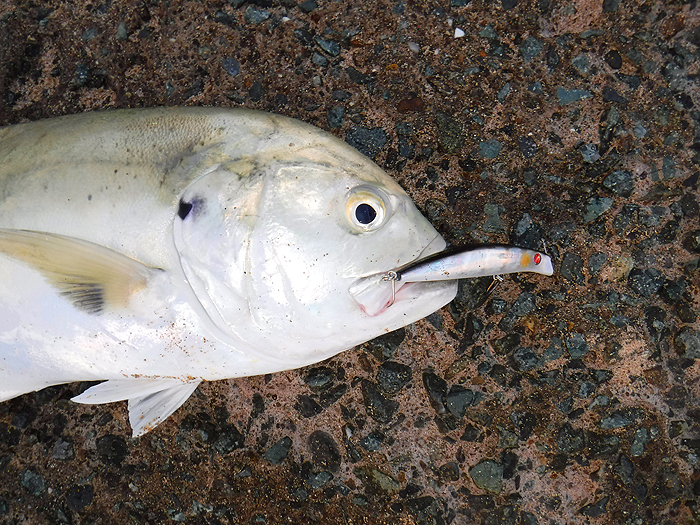 Twelve pounds of crevalle jack on a plug. These fish are my favourites of all. If I look a bit strained by the effort of lifting it - it's because I am. The bait fish are fairly deep so this pelican had to dive from a height.